One sunny afternoon recently, we took ourselves out for a walk after lunch. We hadn’t thought to go exploring new trails, only to take a roundabout route up the hill to the nearby 16th century watchtower for the views. 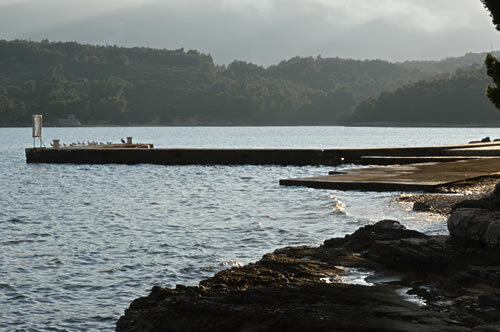 But instead, we found ourselves drawn to the shoreline and the water. Our path brought us to the eastern edge of Maslinica cove, and continued rather enticingly further around the coast towards the headland. This was apparently the beach path, which in summer provides access to the coast for sunseekers. At this time of year, we had it all to ourselves. Starting off in pine forest, the path was damp and slightly muddy. 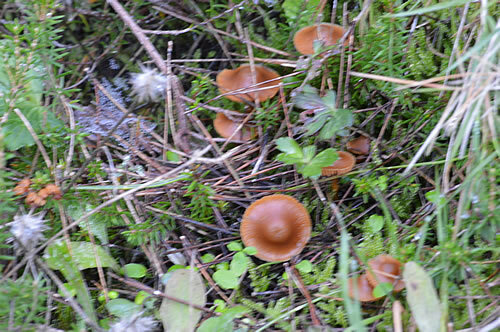 Here and there in the shade, mushrooms grew. 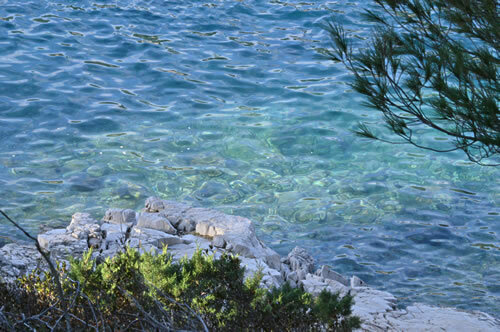 Off to our left were glimpses through the trees of the sea sparkling turquoise in the sun. 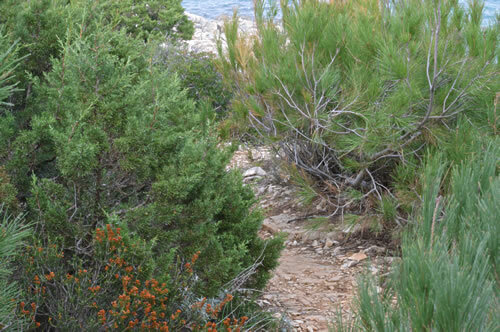 As we approached the waterline, the trail became more rocky, and less shady. Breaking out of the trees, we enjoyed lovely views across the cove. 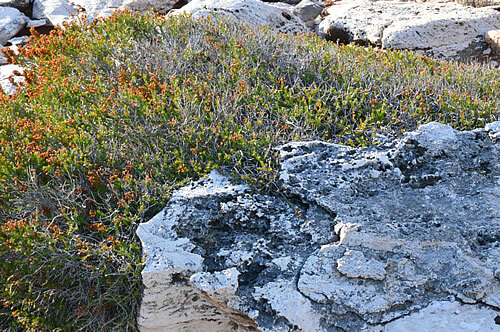 On this northern shore the exposed vegetation has a slightly hunkered down appearance. The heather bordering the beach fits neatly behind the rock as if it’s been clipped. Which, in a way it has! Heather hiding behind a rock! Our path took us over stone outcrops getting quite rough in places. Although not exactly marked in any way, the path was clearly well-trodden. All those feet over the years had left a slight colouration of the rocks and flattened the trail. No signposts were necessary. 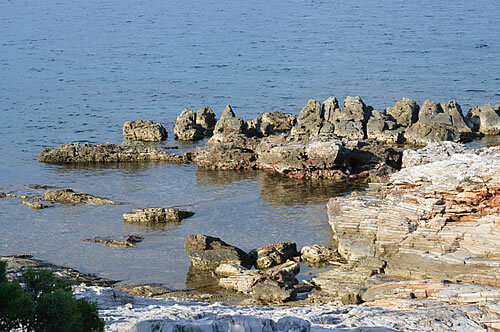 Here and there, the rocks next to the sea provide a natural flat surface, and easy access to the water. 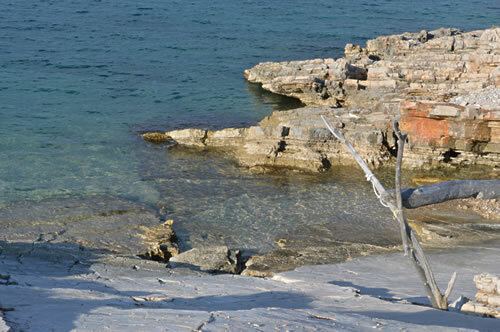 This is not any kind of sandy beach, though there is a gravel beach at the end of the cove. On the other hand, with no sand, the water is perfectly clear. What a stunning location for a house! 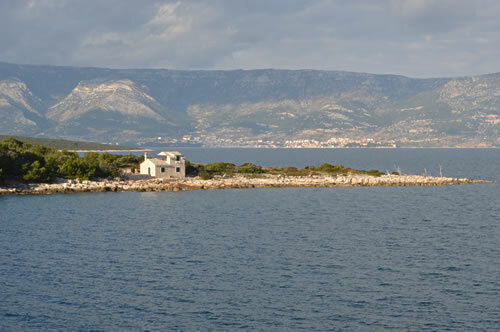 We stopped to admire a beautiful stone house on the opposite headland with the island of Brač lying behind. What a superb location! On most days, anyway. You have to think it must be a bit exposed when the bura blows! I’m fascinated by the geology on show along this north coast. 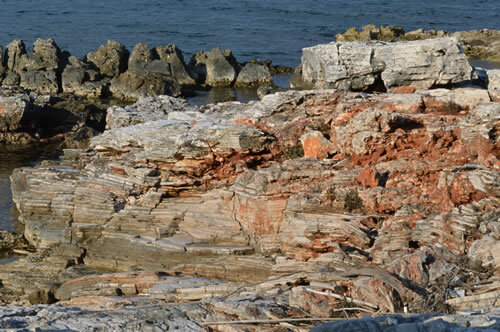 Amongst the layered slabs of limestone, we have a sudden transition into red, iron-rich crumbly rocks. So interesting to think about how it all formed! 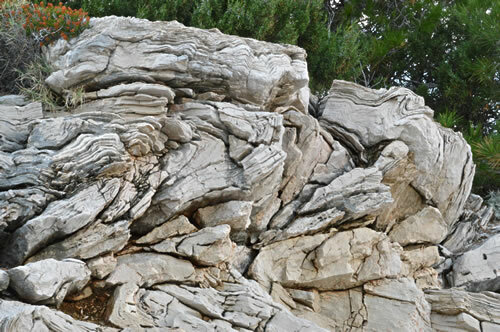 Many of the rocks around here show signs of serious folding and compression. 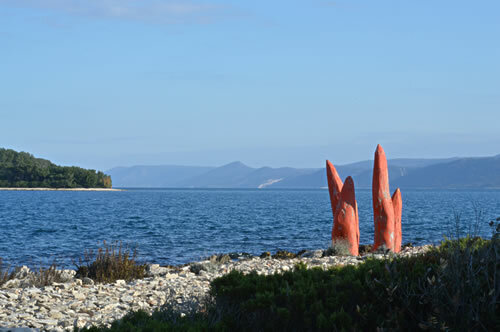 As we reach the headland, a group of pointy orange-red tree trunks come into view, looking for all the world like gigantic carrots or spicy peppers. This is another of the massive sculptures that are dotted around the island. We decide that since the set on Zečevo island is clearly carrots with green tops, these ones must be chilli peppers. What fun! Once round the headland, the path snakes across the rocks into the next cove. 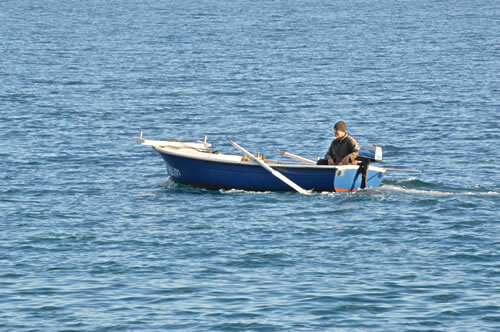 Off the coast, a fisherman in his boat checks his pots. At this time of year fishing is a daytime activity. It’s quiet, only our footsteps, the lapping of the water and the occasional seagull. 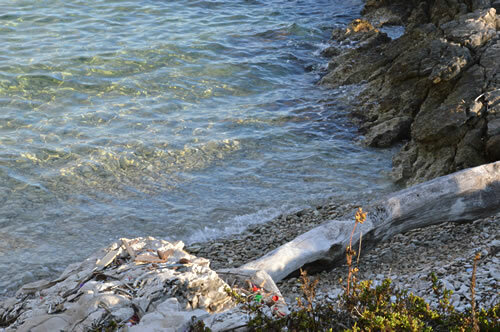 We continue to follow the path around the coast, enjoying the exploration of little beaches and lovely views. We’ve come round this way by boat in the summer, but not tried the footpath. We have a new favourite walk! Our path meanders back into the trees, as the rocks on this part of the shoreline make for uncomfortably big leaps up and down. The drop into the water becomes quite steep, and we have to watch our footing. Our shoreline trail terminates at the FKK campground. From this direction we can enter the campground along the seafront, but are prevented by a wall from following the coast further. How very unreasonable! Of course, there’s no-one here at this time of year. 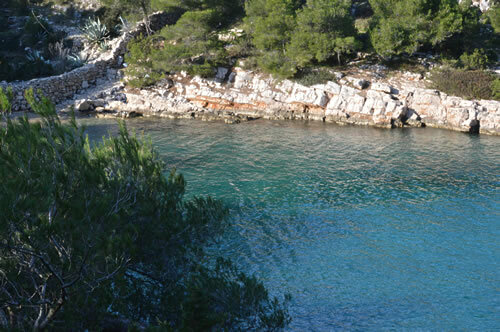 We cut back up to the road and across the neck of the Glavice headland over to the Soline beach. Here, we find a few other people out enjoying the late afternoon sunshine. 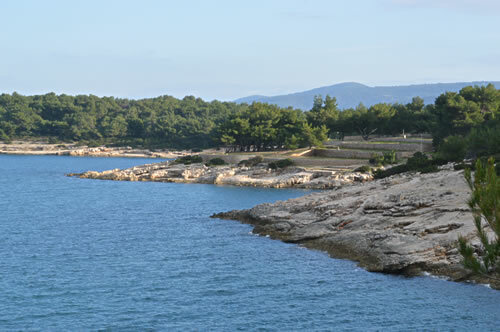 From there, it’s an easy walk along the more popular coastal path back into Vrboska. All in all, a lovely wander along a beautiful coastal path. Just over 4 miles altogether, it took us an unhurried two and a half hours. Map courtesy of Google and the RunKeeper app, which helpfully kept track of our progress!